Our aluminium extension tables have been a popular choice with our customers ever since we added them to our range. Many people appreciate the practicality of having a table that can seat a few extra people when needed. When you find the right extendable garden table for you, we'll deliver it to you free of charge. Our trusted partner couriers pack your new cast aluminium extendable table securely on a wooden pallet or in a large package depending on the size of the furniture. You can track your delivery from the time of dispatch using a tracking code which is emailed to you. Parcelforce, who deal with our smaller to medium sized goods, will send you a text message on the morning of delivery letting you know the one hour time slot when they'll arrive. Geodis, who handle our larger deliveries, will call you prior to your delivery date to confirm both the preferred day and time slot for the arrival of your furniture. The friendly Lazy Susan customer service team will be more than happy to help you arrange a convenient delivery, so feel free to get in touch with them. For more information about delivery, our delivery information page also covers the most frequently asked questions. If you're going to host barbecues and garden parties, you might want to consider the Vanessa table. 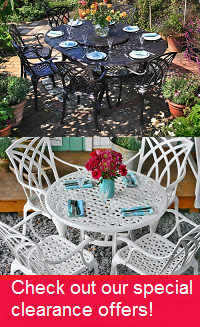 This 10 seater garden table features a classic lattice metalwork design and retains the ability to fit a parasol, whether extended or not. It measures 260cm by 111cm when extended. One of our most elegant contemporary garden tables is the Virginia table. This 6 seater extendable table has a slatted design, and measures 173cm by 244cm once extended. It comes in black, grey, White and Grey, and White and Champagne. If you like the design, but need extra seats, the Virginia table also comes as an 8 seater. The Isabelle table seats up to 12 people, making it another terrific choice for garden parties and outdoor soirées. The top of this extendable metal garden table has a broad lattice design, and simple border. It's easy to clean, weatherproof and functional - a smart choice for the pragmatist who wants to spend more time enjoying their garden. The Isabelle table comes in white or Antique Bronze. A more compact table might be what some of you are looking for. If so, take a look at the Poppy table. This is one of our modern 4 seater extendable tables with a sleek glass table top. It functions as a dining table and a patio table. The table top is made from toughened glass, and the frame of the table is made from cast aluminium. So don't be afraid to take this table outside, it's more than capable of handling the elements. The Poppy table comes in black, Champagne and White, grey, and White and Grey. The chairs for our modern style extendable tables use a hard-wearing outdoor mesh fabric on a cast aluminium frame. There's more than one model of chair, too. A default chair is paired with your furniture set, which is available at no extra cost. Take a moment to see if you like some of our other stylish chairs though. If you like the look of another chair, such as the Maria, Jane or Abigail, then select it instead for between £5 and £20 per chair. Your extendable garden table and chairs will be much more enjoyable when enhanced with a few accessories such as cushions and a parasol. Underneath the section where you choose your chairs, you’ll find offers for cushions and parasols in various colours. Purchasing these in combination with your garden furniture set allows you to save 70% on them, compared to buying them separately, so don’t miss out! Those aren’t the only available offers. You can also get between 20% and 80% off various aluminium patio furniture items, like garden side tables, bistro sets or benches. But these offers will be unique to this page, so combine them with your main order to take advantage. We have some outstanding deals on our clearance page, too. These standalone deals apply to everything, from side tables to 12 seaters. They change all the time, so check back regularly and if you see a bargain on something you like, get it while you can!